Wild About Words! : Get $150 in free books! Easy to do! Get $150 in free books! Easy to do! Who can resist free books? A fellow teacher passed this opportunity to me and I signed up right away...about a week later I got an email letting me know I needed to order my $150 worth of free Magic Tree House books! 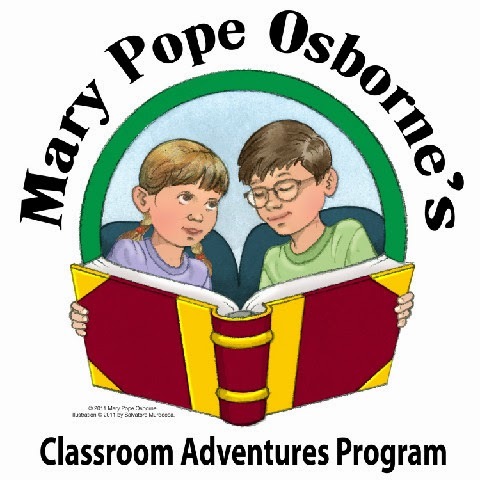 If you work in a Title I elementary school, you are eligible for $150 worth of chapter books and the awesome Fact Trackers, all courtesy of Mary Pope Osborne! You have to submit a short proposal and be sure to mention the Books A Go Go name in the application as it says in their home page. I think their program specifically links to the $150 in books. I am so excited to get my books in the mail! This is the perfect program for my fifth graders...we are going to use paired sets to analyze fiction (with the chapter books) and nonfiction (with the fact trackers). And...because they are a little lower in level, I can accommodate all of my readers and still challenge my more confident guys with more advanced activities! We are just waiting for our box of books to arrive! Good luck and I hope this helps get you more books for your classroom! UPDATE ON 12/22: Because I received this quickie grant and became a member of their distributor, FirstBook.org, I got an email that offered $100 in books, "No strings attached." I figured they would charge shipping and was broke but checked into it anyways and found their special offer of free shipping with a $100 purchase! Ten minutes later, my cart was full, I entered the code, received the free shipping and voila....we got our a books a few weeks back- and they have a great variety at more than 50% off. We got two complete Lightning Thief hard cover sets, 10 Bad Kitties of varying titles, a bunch of Beverly Cleary titles, and 10 or so Franny K. Steins. A HUGE set of books for 100 even! I definitely recommend applying for this grant and for sure, register on Firstbook.org to get their emails. Happy holidays! Is this on Mary Pope Osborne's website? It is...one of the links at the top says "Gift of Books." However, in order to get the flat $150 you have to mention the Books a Go Go program in her application. Just click through the icon on my page and it links you to the program specifics and then through to her page. :)) Good luck! Wow! That's really exciting. Thanks for sharing. Thanks for it . Just puzzled if by free books I would appreciate betterfree books.Good luck. I'm sure it will! Only took me a minute to sign up and got my email Friday! Good luck! The application asks to list the books needed. Do you need to do that part if you mention Books A Go Go? I don't believe so...all I mentioned was Books a Go Go and got the grant. I think she uses this application for two different programs. :0) Good luck! Thanks for sharing this awesome opportunity. I do have a question. Do you need to enter the school's phone number or just your own? I think I entered my personal number but no one uses it to call or verify anything, at least as of yet. Good luck...swing back by and let me know if you get your books! Have a great holiday! Seventeen years of teaching, and I am still proud to say I am a teacher! I am passionate about the work we do and still believe it is the most important job on Earth (besides being a parent). We are responsible for laying the groundwork for creating thinkers. Engaging students in the process of thinking and watching them "get it" reminds me of my purpose as an educator....to inspire! May you find a little inspiration in this blog! Secret Knowledge of Grown-Ups....Twist Your Classroom Rules! Beat the Test Day Blues! Must Have Picture Books Linky! Promoting a Positive Classroom Environment...EASY!